Make-A-Lamp Kit allows you to make-a-lamp out of almost any bottle or jug with "cut to size" cork wrap adapter that may be reduced for different opening diameters (to a minimum of 1/2"). U.L. 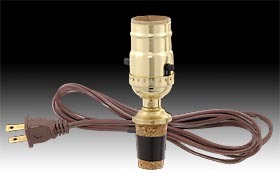 listed brass plated push-thru socket and 6 ft. brown cord set. 30350 - Make-a-lamp kit with 1 1/4" base dia. 30351 - Make-a-lamp kit with 1 3/4" base dia. 30352 - Make-a-lamp kit with 2 1/4" base dia. No reviews yet for the Make-A-Lamp Kit.